The practice of headhunting on Borneo was strongly associated with notions of fertility and renewal. It was essential for restoring cosmic order, sanctifying and renewing relationships with ancestor spirits, and ensuring the spiritual and physical welfare of whole communities. After headhunting was largely abandoned by the Dayak and Iban groups of Borneo in the late nineteenth and early twentieth centuries, the skulls and bones of wild swine, bears, primates and apes were used for rituals dependent on headhunting and sacrifice. 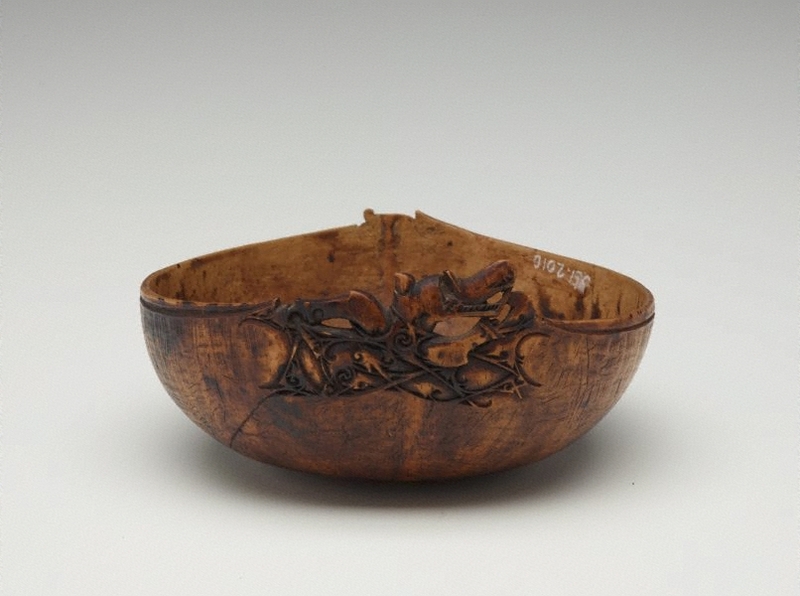 Probably fashioned from the skull of a large primate, this bowl would have been considered a prized hunter’s trophy and a ritual implement imbued with the spiritual essence of the deceased prey. The simple form is embellished with the depiction of the ubiquitous Bornean ‘aso’, a demonic dragon–dog beast originating from the underworld and associated with fertility and protection. The delicate scrolling design is reminiscent of the ornamentation styles of the Kenyah and Kayan groups of Central Kalimantan. Christopher Wilson, pre 1989-1996, Sydney/New South Wales/Australia, purchased in Indonesia.